A chance to experience the two most popular islands in the archipelago, this twin-centre is ideal for those in search of sand, sea and sunshine. 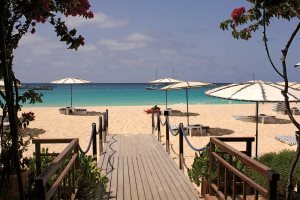 Enjoy the crystal-clear waters and soft golden sands of Santa Maria or explore the assortment of water sports and the vibrant atmosphere of the town, sampling tasty local and international cuisine at a variety of restaurants. And, each day, the pier comes alive with local fishermen bringing in their catch of the day to sell to locals and tourists alike. Heading away from the beach, explore the salt flats at Pedra de Lume and float in the water, or head to the natural swimming pools and underwater caves at Buracano for a quick dip or to witness the beautiful ‘Blue Eye’. Hotel Morabeza is located right on the beach, just a short stroll from the main town. Find out more about Hotel Morabeza. Home to some of the most dazzling beaches in the archipelago, Boa Vista’s ever-changing landscapes are sculpted by the wind. Saharan-like oases are dotted around the interior and depending on the time of year, loggerhead turtles can be spotted laying their eggs on the beaches. Quad biking along the sand is a fantastic experience, or head north to visit the Cabo Santa Maria shipwreck. The rolling white dunes of the Viana Desert are also worth exploring, but the real draw here is to relax on the uncrowded miles of bright white sand, listening to the waves roll in. The Iberostar Club Boa Vista boasts a remarkable location above Praia de Chaves, arguably the finest stretch of coastline on the island. Find out more about Iberostar Club Boa Vista. 7-night island hopping itinerary that explores two of the most popular islands. 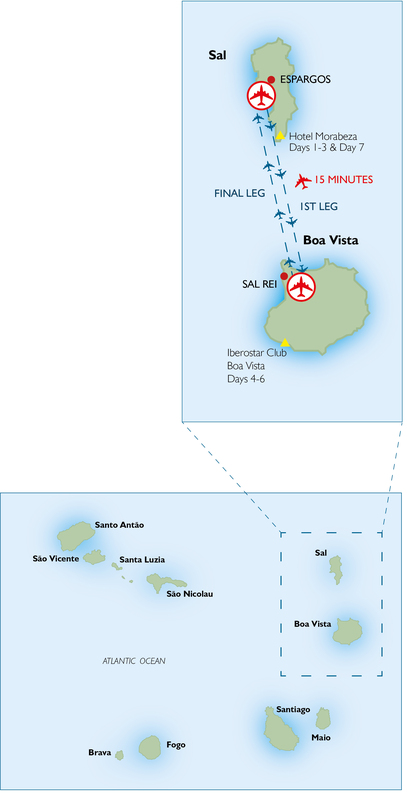 Upon your arrival in Sal by your international flight, you will travel to Boa Vista and return to Sal by internal flights. These flights are provided by Binter and whilst every effort will be made to book direct flights, due to schedule limitations, these flights may be indirect.